A little over year ago I put a list of my favorite presidents and politicians on this blog. I'll also mention that my favorite Canadian Prime Minister was Wilfrid Laurier (1841-1919). Yes, I know all the Prime Ministers I've listed had flaws, and some fairly serious flaws, but if you look over all the Prime Ministers, these are the five I like the most. I also like certain aspects of Winston Churchill and Benjamin Disraeli, but politically I would probably have voted against them in elections, and they don't really belong on my favorite British politicians list. What we boycott in our family. What do we boycott in the Hadley-Ives family? There are a few thing we try not to buy, and then there are companies we try to avoid. When I was a kid in middle school I already boycotted certain products, partly for political reasons. I remember certain brands of shoes being popular, but I wouldn’t let my parents buy them for me or wear them because I thought they were made in non-democratic countries where the workers weren’t free. I still make some political decisions when I’m behaving as a consumer. I’ll share those now. One of the companies I boycott is Exxon-Mobil. I won’t buy gas at one of their stations, and I won’t go to any of the companies that are owned by ExxonMobil. This boycott is mainly motivated by ExxonMobil’s funding for politically-motivated attacks on science around climate change. I believe they have even hired people to attack critics and journalists who have tried to expose how ExxonMobil fought the idea that fossil fuels were contributing to climate change and global warming. I attribute much of the delay in the American political will to make meaningful changes to avoid or diminish global warming to the campaign of ExxonMobil. That’s why I never stop at their gas stations. Royal Dutch Shell is another company I cannot abide. I hold them partly responsible for the execution of Ken Saro-Wiwa, an author and businessman who complained about conditions in the oil producing area of the Niger Delta. He believed that not enough of the profits from the oil extraction was getting back to help raise the living standards of the people who lived in the areas where drilling was taking place. He launched a non-violent movement for economic and social development and justice. When the Nigerian government arrested him and decided to kill him I believe Shell could have applied pressure to stop his execution. It also wouldn’t surprise me if Shell was in fact giving indications to the Nigerian government that the Shell corporation wanted Saro-Wiwa silenced. So, I never buy gas at Shell stations, nor do I buy any Shell products. I don’t shop at the Family Dollar general stores. I find the sweat-shop retail discount chains like this depressing. Walmart and Sam’s Clubs are other stores I scrupulously avoid unless there is an emergency and no alternative. These are part of the trend of corporations delivering shoddy, cheap goods made by workers from unfree countries where workers get killed if they try to organize and environmental and job safety protections are minimal. This provides lower prices, but it also means lower wages for low-skilled American workers and workers in other nations where decent labor laws and political freedoms keep production costs slightly higher. Not only this, but these companies have a tendency to treat employees unfairly (unpaid overtime, stealing time from employees, etc. ), which is exacerbated by the way the companies set the goal of maximizing profits so far ahead of the other goals that for-profit firms should have. Finally, these sorts of companies tend to indoctrinate workers to be against unions, and they make contributions to the persons whose political views differ most distinctly from mine, so I have that motive for boycotting or at least avoiding them as much as possible. I don’t shop at Lowe’s Home Centers. Back in early 2003 before America invaded Iraq many peace demonstrators in Champaign County, Illinois were demonstrating against the possible upcoming war in Iraq. Some of them parked vehicles in distant corners of a local Lowe’s Home Centers parking lot, far from the store, and not in any way taking parking spots from potential customers. The owners or managers of that Lowe’s store had peace demonstrators’ cars towed away, and so I will never shop at Lowe’s. I almost never buy meat when I shop for groceries. I don’t like the industrial food production system we have in the United States. I think it dehumanizes us because it creates a bad relationship between people and the animals they eat. I will sometimes buy meat at farmers markets when I’m buying directly from a farmer who can tell me about how his animals lived and were slaughtered. I probably eat animal flesh four or five times per month, about once a week, but this is mainly because Jeri often buys or prepares food with meat in it. If I was doing more of the cooking and grocery shopping we would almost never have meat. It’s not so much a boycott, but I really almost never watch anything on television or listen to anything on radio if commercials will interrupt what I’m watching or hearing. I find commercials ridiculous and intrusive. When I see an advertisement that I find exceptionally insulting, I try to make a note to myself to avoid buying whatever the advertisers are flogging. I would not buy any Amway products. Amway supports some of the most reactionary political agendas, and I want none of my money going to support the people at the top of the Amway marketing pyramid. I tend to make a point of never buying anything from companies that send me too many e-mail advertisements, and I certainly boycott all spammers. I also don’t buy things from companies that use annoying pop-up window advertisements on the Internet. That’s about it for what we boycott. 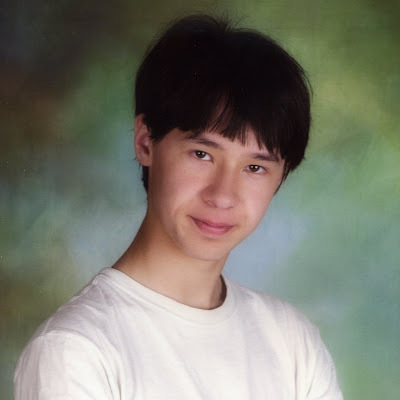 Here is Sebastian's Spring 2009 8th grade school portrait photograph. 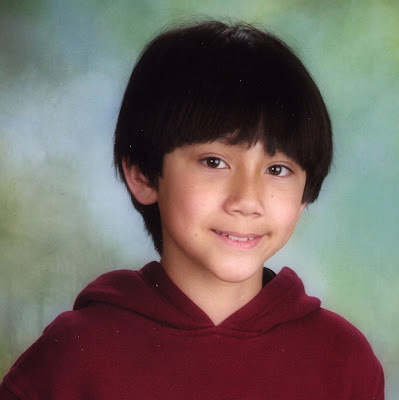 This is Arthur's Spring 2009 4th grade school portrait photograph. 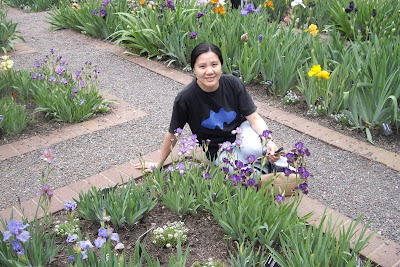 On mother's day we went to the St. Louis Art Museum to see the Ming Dynasty treasures first, and then after we had marveled at that exhibit we went to the Missouri Botanical Gardens to see the iris blooms. 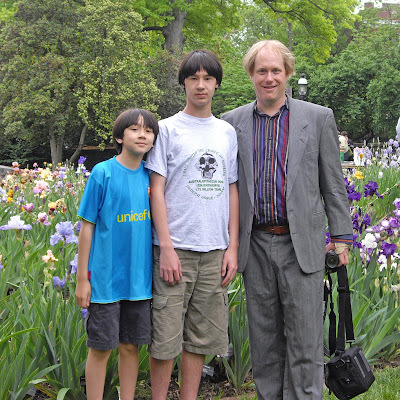 Chun-Chih took this picture of the Hadley-Ives guys in the iris gardens. 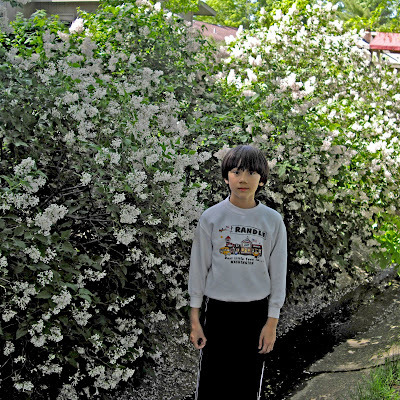 Here is Arthur in our backyard among the lilac flowers. The strong odor of these lilac blossoms gives our yard a delicious scent in mid-May. 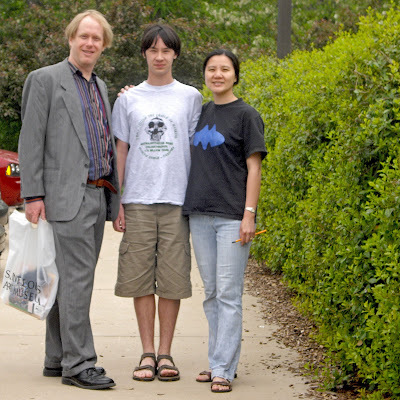 I'll share some more family photographs today. Here are some pictures from the past few days. 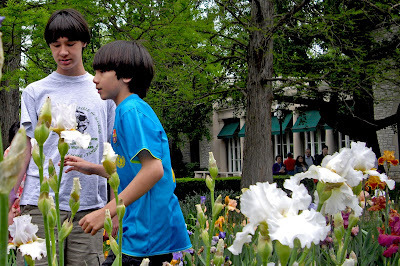 Here are Arthur and Sebastian at the Missouri Botanical Garden. 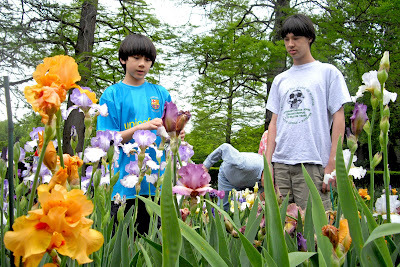 We went on mother's day to see the iris flowers. I like this picture of Sebastian and Arthur along with the white iris. 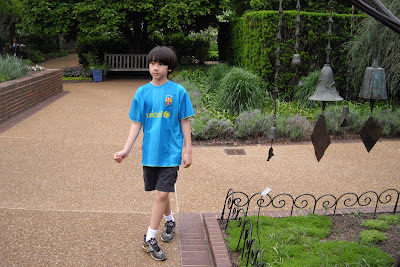 I think this is a good picture of Arthur walking around in the botanical garden. We have huge lilac bushes in our back yard, and in the second and third weeks of May the air around our home is perfumed by the lilac scent. 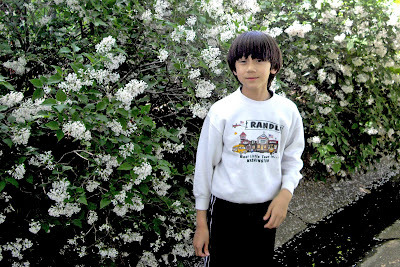 Here is Arthur back by the lilacs. Here is Chun-Chih. Arthur took this photograph with his new camera, which was a birthday gift he received in April. 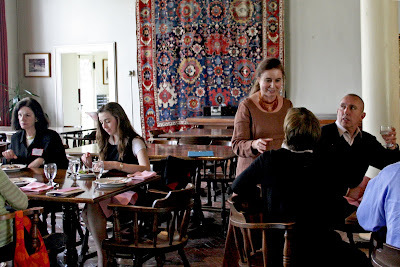 I want to share some photographs of recent events around here. This is a photograph from the Symbolist Conference held at Allerton Park in Illinois. Rosina Neginsky, my colleague, organized this conference. 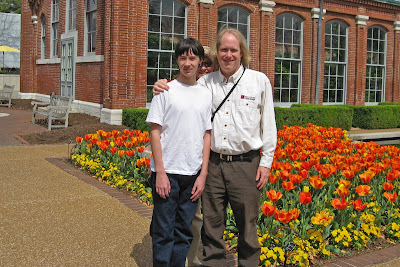 This is photograph of Sebastian and myself in the Missouri Botanical Gardens. 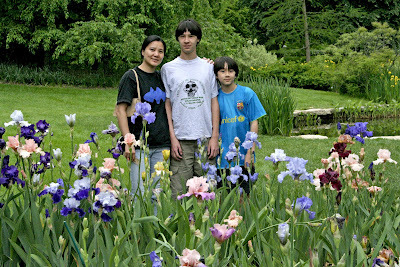 This is Jeri with Sebastian and Arthur at the Botanical Gardens on Mother's Day. This is our home in the morning, with a storm moving in from the west, but the sun shining out of the east on our house and our birch tree. Arthur is coming out of the house on his way to his bus stop. I've decided to share some Baha'i-themed music videos today. I'll start this one from the Pacific Ocean Islands, featuring a song about gossip. And then here is one from Merz. I'm not sure if it has a Baha'i theme, but Merz did some great Baha'i songs in the past. Here is some dancing and music, including Kevin Locke playing flute.